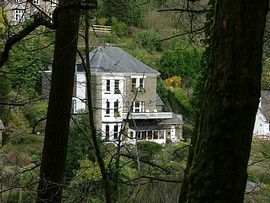 Woodlands is a substantial, well appointed Guest House with an informal, friendly atmosphere. Situated overlooking Summerhouse Hill and the unspoilt wooded valley of the West Lyn river, Woodlands is only a few minutes' walk along the Lynway footpath which runs past the rear of the house to Lynton centre. Woodlands has a choice of single, double and twin rooms all with colour TV, radio and tea/coffee making facilities. 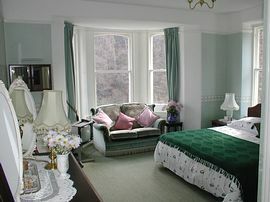 Most rooms are particularly spacious, beautifully furnished, fully en-suite and have splendid views across the valley. Ideal for spring and autumn breaks, the property is centrally heated throughout and there is a comfortable lounge where guests may relax in front of the log fire in cooler evenings. The sun lounge with its beautiful outlook across the valley is an ideal place to sit and read or enjoy a drink. There is a private car park and a garden which extends down to the West Lyn river, also a boot and drying room with laundry facilities if required. There are many other little touches to make your stay more enjoyable, however, if you have severe mobility problems Woodlands may not be suitable as our drive from the car park to the house is steep. If you are not sure, please give us a call and we will be happy to answer your queries. Three to six nights £25.00. Seven or more nights £23.50. All prices shown are per person per night and include full English Breakfast. Take the road up the hill signposted 'alternative route to Lynton for light cars'. After a short time you will come to a junction (where you have the right of way) and the road doubles back to Lynton. At this point carry straight on passing the Lynbridge sign. Woodlands is situated about a quarter of a mile along on the right hand side. Take the B3234 towards Lynton/Lynmouth. After about half a mile the road forks, take the right hand fork signposted Lynmouth. Pass the Bridge Inn on your right and very soon you will come to Woodlands.